The W&M Student Assembly (SA) is not listening to students. This truth is clear in both our data and the zeitgeist of the College. When you compare the priorities of the students, discerned by online surveys and club queries, with the types of initiatives SA passes, it becomes clear that our student government operates independently from student interests. This disparity may seem surprising, yet it has insidiously crept into students’ widespread discontent and confusion with SA. Students wonder what SA does exactly because SA is not acting on any of their priorities. Students’ campus concerns are intertwined to this concept: people need to feel and be heard. We want our distaste with food to be heard, our inability to park anywhere be heard, our diverse opinions to be voiced. All of these issues culminate in a campus with incredible stress levels as we yearn to just. be. heard. Being heard is not just a requisite of democracy, it is a requisite of the soul. In a world where young people are vying for voices, it is integral that, at the very least, our fellow student representatives will listen. We will listen. With both our SA insider and outsider experience, we are fully prepared to act on the issue’s students want to see changed rather than crafting tangential agendas. Having literally presented on the above data to SA multiple times, we understand that it is time for a new form of leadership to W&M student government. We understand that good public service requires both effort and integrity. Just as we’ve done for the past two years, we will continue to go to students to hear their concerns, rather than ask them to come to us. Whether others are looking or not, we will be staunch defenders of student voices and opinions. We are ready to roll up our sleeves, get to work, and lead the most obvious political revolution of our time: listening. How our platform came to be: This platform specifically reflects the desires of students after they were surveyed by our team. Rather than providing services that are speculative or redundant, we want to make sure we’re highlighting the things that were most important to the students, while also threading in important issues including diversity, sustainability, and college affordability throughout. Our platform is held up by concepts of Diversity and Sustainability. On our campus we consistently hear that we need diversity and sustainability without much more substance behind those words. We have included these in every part of our platform, as they are central to William & Mary and us. We need to be checking ourselves at every step of the policy-making process to ensure that our ideas are both diverse and sustainable. Food Reform: Food has been a top concern of students. We’ve developed a very unique relationship with Sodexo that has already delivered much change, but there is still more to do. Establish more student flex options. We have lost three restaurants in Tribe Square over the last 3 years! Establish sustained communication systems between SA and Sodexo to ensure that once they hear our concerns, changes are actually made. Make all survey data public and visible. This will add a level of accountability to our feedback system. That way, for example, if a food item is receiving less than a 2 out of 10 rating, Students can see this and incentivise Sodexo to pull the item and/or improve it. Partner with Take Back the Tap to ban the vending of water bottles on campus. Parking Advocacy: Our philosophy is that students should not have to pay for parking at a school where they already pay tens of thousands of dollars in tuition. We advocate for more parking privileges for students. In an effort to be sustainable, we want to ensure that any new construction of lots are environmentally mindful as we push for more non-automobile forms of transportation. Stop the process of forcing students to move their cars for home football and basketball games. Mental Health Progress: SA needs to walk the walk with the issue of mental health. We need more therapists – period. We need to draft a comprehensive agreement with the administration to fix this problem that is more than constructing a new building. Allocate student fees to fund new therapists at the wellness center and then push the administration to then sustainably fund the positions. Advocate for a College Policy Wellness Clause, wherein if students have 3 or more exams in a week, they receive an automatic extension on one of them. Fight for more diverse therapists, as students should be able to seek the counsel of professionals who at least marginally share their lived experience. Support the current efforts to train student mediators to handle crisis situations with their peers when they cannot turn to other resources. Allow students to sign up for counseling appointments via online forms rather than forcing them to make phone calls or walk in to do so. Curtailing Polarization: Many students are afraid to voice their concerns and opinions on a campus that, at times, can be divisive. As the Washington Post argues, this is how democracy dies. We will do everything we can to ensure everyone is comfortable speaking up and that there is a diversity of thought on campus. Advocate for more diverse, impactful, and controversial speakers. Add training on civil discussion during the first year orientation process to supplement the current diversity exercises. Amend the COLL curriculum to teach students how to not just debate, but have civil discussions within this increasingly polarized world. Representation: All of these platform points tie back to representation. Voices are really important to us. The reason people do not know what SA does is because SA doesn’t do what people want – and we have the data to show it. Under our administration, students’ voices will be heard and upheld. We will govern by a higher standard of leadership and public service. For us, making the effort to enact student’s concerns is more than just lip-service. Donuts with DeMarco - A monthly event in which SA will provide donuts on the terrace, where students can sit down and share their concerns with Dave. Online Platform Tracker - Have a running list of our projects with updates so the students can see where we are in accomplishing our initiatives. Amend the SA Constitution so that representatives must visit club and chapter meetings. David is the only representative to consistently do this - it should be the standard of public service. Survey the student body to receive their input and preferences on our current SA initiatives at the time. We will act on these results, rather than ignore them. This data will be codified in order to track changes and visualize student needs. Address controversial issues on our campus with Town Halls where students can talk to David and Nyla directly. We will also include administrators and faculty who are relevant in addressing the issue. Create the Virginia Student Association, an organization made up of the Student Body Presidents in the Virginia public university system to advocate for students in the entire state on issues like college affordability, mental health services, Growth4VA and campus safety. Advocate so that the Presidents can serve on the State Council of Higher Education for Virginia on a rotating basis. Establish an Attorney General position in SA to serve as a watchdog over SA to add another level of accountability to your representatives. Grad students pay as much in student fees as undergrads. However, due to their busy course load and lack of outreach from undergrad leadership, they are unable to take full advantage of all the things that make being part of the Tribe so great. We want to serve all students and ensure that everyone feels like a part of our community. Bring student services like parking, ID cards, mental health counseling, and financial aid to the graduate schools by appointment to increase their access to these services. Improve access hours to campus facilities over breaks, when most undergrads leave but many graduate students remain. Increase funding for graduate events. Hold quarterly meetings with the Presidents of the Student Bar Association, Graduate Council, and Graduate Education Association to discuss their priorities. Advocate for diversity in student recruitment and faculty hiring at both the undergraduate and graduate school levels. Renegotiate America To-Go so student organizations have greater options for their events. This is an anonymous reporting system used by the undergrad campus in which students can alert Care Support Services that they are concerned about a fellow student. The student then receives an email providing them with helpful resources on campus. This popular undergraduate tool could be very useful in a stressful graduate environment. David DeMarco is a sophomore at the College and serves as both the Class of 2021 President and the IFC Vice President of Health & Wellness. Studying Government and Data Science, David aims to use his degree to fight polarization, bring truth back to politics, and revive representation in government. The truth and being heard are concepts David hold very close to his heart. Accordingly, David serves as a rhetoric coach for students without debate programs in Philadelphia and Richmond. When he’s home in Kennett Square, Pennsylvania, he volunteers at a local mushroom farm as an ESL Civics teacher, helping Hispanic non-citizens study for the US citizenship test. In his time as Class President, David has focused on food reform and representation. After petitioning Sodexo in December 2018, dining services agreed to a litany of changes based on student concerns. Additionally, David makes a serious effort to hear and document student feedback. Whether its through online surveys, querying club meetings, or dressing up as Santa on the terrace, David has consistently been there to listen to students. The project David is most proud of is the “Hurrication Ride-Share Forms.” When W&M was forced to evacuate due to Hurricane Florence, David created impromptu ride-share forms and manually connected students who needed rides to and from campus. David is also proud of his work on campus health initiatives. In February 2018, David passed a bill subsidizing STI tests at the Health Center for students. Additionally, David helped lay the groundwork and created the database for a project which provides emergency menstrual products in bathrooms across campus. Nyla Pollard is a sophomore at the College and is a double major in Sociology and Education. She plans to receive her Master’s Degree in Higher Education Leadership and Administration. 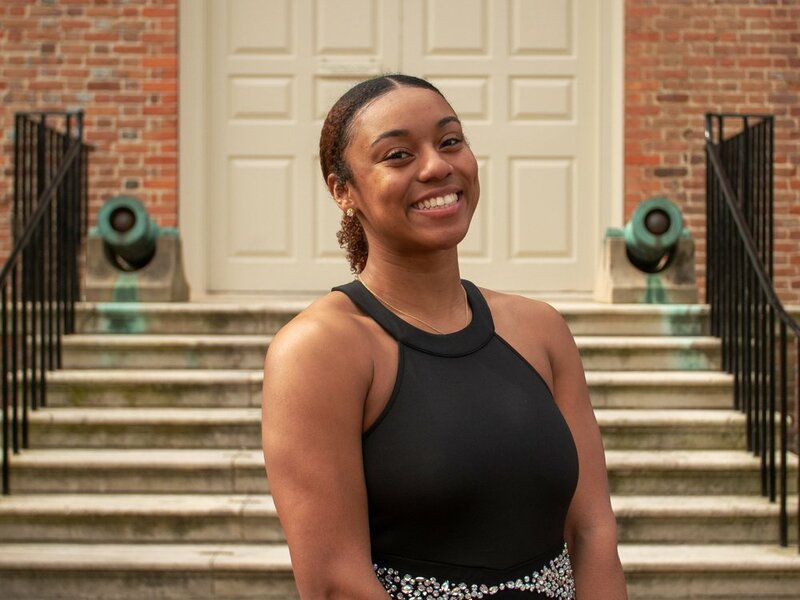 Nyla aspires to dedicate her life to improving the experiences, accessibility, and quality of the university/college experience throughout the nation. At William & Mary, Nyla is on the Women’s Basketball Team. She has been in the starting lineup since her freshman year and is a key contributor to the team. Nyla is also a member of the Black Student Organization, where she is constantly exposed to the different experiences and outlooks of members within the community. Nyla is also fortunate enough to mentor elementary school students through Classroom Champions—a program intended to provide students with the guidance, skills, and lessons necessary to succeed both in and out of the classroom. Being able to positively impact the life of just one individual is a success to her. One of Nyla’s favorite idioms is, “Where there is a will, there is a way.” She knows that when she wants to make something happen, she can make it happen. She knows that passion and determination are the keys to success, so she is passionate and determined about everything that she devotes her time and mind to.